The above photograph seems to illustrate how many modern people eat. 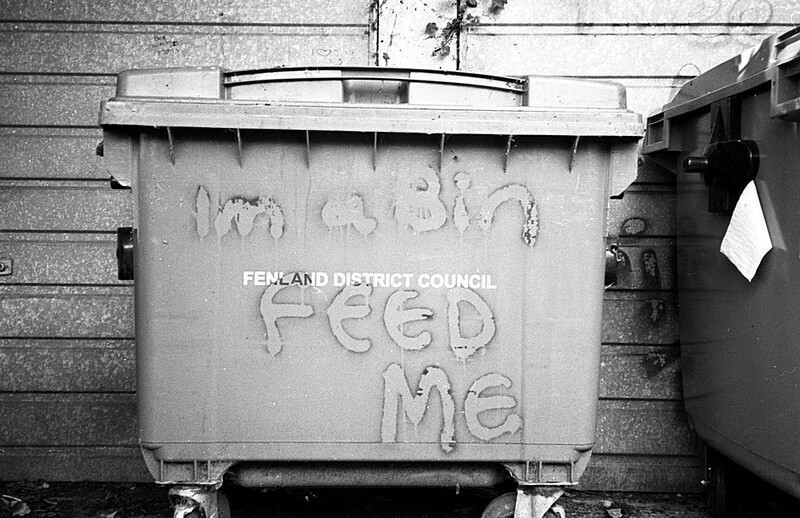 I took it in a Wisbech back street, using the 50p camera, Olympus XA2, loaded with Ilford HP5+ film, which I developed in Kodak D76. What prompted this post? I was shopping in a local discount store today, and I spotted their range of Paleo and Atkins diet aids - ketosis pills, high protein this, high protein that, and a ... Paleo Protein Bar. I just cannot imagine a palaeolithic hunter-forager unwrapping and then biting into factory produced "protein bar". The ketosis pills were ridiculous enough. Still, it reminded me of why I turned my back onto the Paleo diet crowd years ago. The Paleo-Diet is based on the assumption that humans have not had time to adapt towards a modern diet. This they might argue, is why we grow overweight, unfit, and suffer many illnesses. They suggest that humans evolved to a hunter-gatherer diet over many thousands of years. In order to replicate some of our "natural" food groups, Paleo-dieters do not eat: junk food, fast food, bread, cereals, any wheat or flour products, refined sugar, beans, legumes (including peanuts), potatoes, processed vegetable oils, or any dairy produce. Some Paleo-dieters with European heritage, also avoid certain foods, that originated in the New World, including for example, tomatoes, avocados, and peppers. Although this proscription does not appear in the mainstream, there are some Paleo-dieters that believe that people without a long New World heritage, have a genetic based conflict with such food groups. On my recent excursion into genetic profiling, I've seen posts from some individuals actively looking for New World food intolerant genes. I know where they are coming from. Before I launch my critique, I should just start with what I do agree with the Paleo-Diet. I fully agree that we have not had time to adapt to the modern diet. However, I refer to the massive changes to our diet over the past 100 years, not over the past 10,000 years. I agree that we should avoid junk food, fast food, processed meat, sugary foods, and processed oils. I feel that we should also reduce our consumption of refined white wheat flour products. I do like how the more sensible paleo-dieters seek out and eat a variety of vegetables, fruits, and nuts. By avoiding starchy foods (rice, pasta, and potatoes), they sometimes consume more portions of vegetables. It might encourage people to think like a hunter forager. Foraging at the local farmshops, markets and stores for more variety of natural wholesome foods. To consume mindfully. Avoid cheap meats. It is based on bad science, bad anthropology. 10,000 years represents lots of generations for us to adapt to an agricultural diet. Lactose tolerance is evidence of that evolution. The book The 10,000 year Explosion: How civilization accelerated human evolution. 2009. Cochran and Harpending, explores these issues, and revealed that human evolution, in terms of deviations within our population alleles, has actually accelerated. One of the pressures behind this acceleration has been identified as the agricultural diet. Anthropologists can also point to farming populations, for example, some dairy farmers in Africa, that are particularly tall and strong. The past 100 years, yes, I can agree, we have not had time to biologically adapt to the profusion of refined sugars and processed fats that surround us daily. However, you cannot tell me that agricultural foods are all bad. What are Paleo-dieters actually eating? Those fruits, vegetables, grass-fed beef, and even nuts, are all agriculturally produced. I don't see many Paleo-dieters living on whatever they forage or hunt from the wild alone. The truth is that hunter-foragers were highly adaptable to different diets. As they spread across the planet, so they encountered different resources. They adapted partly by human culture, by lifestyle, but humans are also great omnivores and opportunists. I once saw a British TV documentary about a a woman with an eating disorder, that restricted her diet to one flavour and brand of corn snacks. Okay, her skin looked a bit pasty, but she was not noticeably overweight, and her disorder had not prevented her from surviving to adulthood, and from raising her own children. What I hate about the Paleo-diet, particularly about some of it's more extreme schools, is that it is restrictive. It prohibits the consumption at least of legumes, potatoes, even whole grains cereals, and beans. Some of it's followers also avoid tomatoes! Come on people. Again, I'm not criticising the mainstream Paleo. But some of it's followers really go for the meat, even processed meats! They treat it as a high protein diet. In their eyes, hunter-gatherers ate largely what they hunted. Although some hunter-gatherer communities did eat a lot of fish and whale meat for example, most of them in reality more likely resourced most of their calorific requirements with foraged foods. For example, humans have an enzyme that converts starches from plant roots and tubers, into useful sugars. Other species of apes lack this enzyme. This would suggest that at some point of our ancestry, the ability to eat and digest roots was pretty essential for survival. The prized tool of many bush women in SW Africa until recently (it's now most likely a smartphone), was the digging stick. Expertly used to dig up edible roots for the pot. Hunted meat was culturally more valued - but foraged foods provided most of the calories. I've seen Paleo-dieters praising American bacon and tinned ham as a good food source. I've seen the same people wince at the idea of eating fresh liver or sprats. I'm pretty sure that fresh tomatoes, rolled oats, and even local potatoes (in the right proportion), are healthier than fried processed bacon. But that's just my opinion. Any focus on diet, is only half the equation when it comes to living well. The other half is activity. Do we exercise? How often do we get out of breath? Are we really happy, Do we push our muscles to the limit? Do we take time out, to stroll through green, clean air areas, do we relax properly? That's today's sermon. Eat more vegetables and fruit, and you don't need to avoid oats or tomatoes. Consume mindfully. Get moving. Enjoy life.